The average adult right whale consumes about a ton of food a day, eating billions of tiny crustaceans called copepods that are packed with protein and calorie-rich oils. “To whales, copepods are juicy, greasy Big Macs, in a really small package,” said Mark Baumgartner, a biologist at Woods Hole Oceanographic Institution. Like hungry people at a buffet, North Atlantic right whales gravitate to places where vast, dense patches of copepods periodically appear. If scientists know where and when copepods will show up, they can predict where whales will be. That offers vital information for efforts to manage fishing and shipping traffic to avoid encounters that often kill these endangered whales. 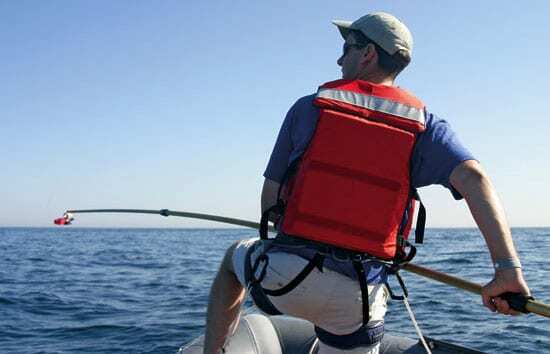 In 2005, Baumgartner and colleagues launched a pilot study in the Great South Channel off Cape Cod, a well-known springtime right whale habitat, to reveal the mysteries of right whale feeding grounds. Aboard the National Oceanic and Atmospheric Administration’s ship Albatross IV and the WHOI research vessel Tioga, they mustered an arsenal of scientific instruments. Several instruments were used to measure copepod concentrations and to map the dense copepod patches. Other instruments collected copepods and measured the temperature and salinity of the ocean. Scientists also temporarily tagged whales with acoustic transmitters (which the whales can’t hear) and tracked their dives and movements with four hydrophone-equipped buoys. For the first time, the scientists deployed autonomous underwater vehicles (developed by WHOI oceanographer Dave Fratantoni) with instruments that continuously recorded whale sounds. “We’re piecing together all the factors and conditions that come together to create these large aggregations of copepods,” Baumgartner said. Understanding the complex dynamics of the ecosystem “may give us an idea of where to look for other right whale habitats we haven’t discovered yet,” he said. It also will help scientists understand how those ecosystems can shift or be disrupted—especially by a changing climate. The research was funded by the WHOI Ocean Life Institute Right Whale Research and Conservation Initiative and the National Marine Fisheries Service.